Harikrishnan Panicker and Deepti Nair, two talented artists with unbelievable imagination, have created a whole new body of work, Oh, The Places You Will Go! 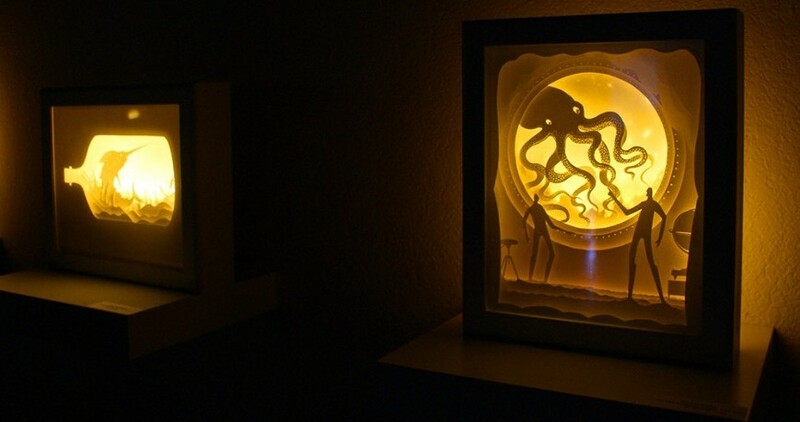 It features beautiful, hand-cut, back-lit paper sculptures. Their travels near and far have been a great source of inspiration for the artwork — which is part of a new exhibition at Black Book Gallery in Denver. Hari and Deepti recently completed a commission for Neil Patrick Harris titled The Magicians Hat. This piece is inspired by the legend, Rabbit in the Moon. It features Neil with his family. Nair and Panicker have infused their paper sculpture concepts with mythology and science fiction. Each piece is lit from behind or below using LED strips. The boxes that house their artwork are exhibited in dark rooms to enhance the effect.